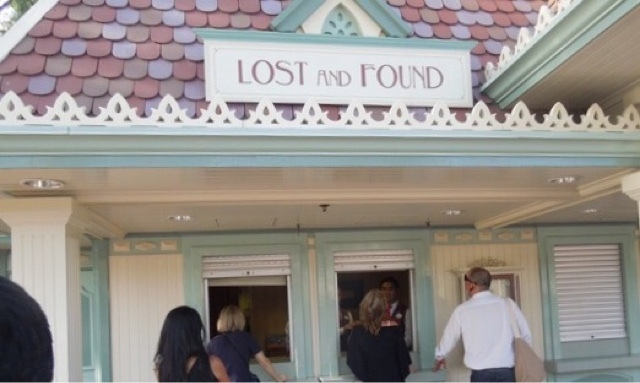 Have you lost anything at Disneyland? I definitely have, and the amazing Cast Members (almost) always get it back!!! Here are a couple "lost and found" stories of mine that can help you know what to expect when you lose something on your otherwise awesome vacation. My family was walking out of the park after an awesome three and a half days. We were just about to go through the tunnel under the train tracks to exit the park, when we noticed that my then 18-month-old only had one shoe!!! He had it at the other end of Main Street when we stopped to take a picture, so I knew it couldn't have gone far. We started circling back up and down Main Street. We checked everywhere we had walked plus places we thought someone might have put it if they found a shoe in the middle of the street. (Anyone else getting an image of a tiny shoe singing "I'm Walking Right Down the Middle of Main Street USA?" Just me???) Anyway, we didn't find it! We exited the park and headed over to the lost and found. They didn't have it - my guess is a Cast Member was probably bringing over right then. So I drove 7 hours home with only one shoe for my son! Luckily no one really cares if a baby is wearing shoes or not so it wasn't really an issue when we stopped on the road. Fast forward two days and we got a package in the mail. It was the shoe!!!!!! I was amazed how quickly it got to us. This is a weird one! I had this set of Minnie eat hair clips. It was two pieces: each clip had one ear with a bow on it. They were a hand-me-down from my mom who had trouble keeping them in place when she wore them. We figured they'd stay better in my super thick hair. They didn't!! When I went on Splash Mountain, I thought I'd be proactive and take them off so they didn't fly off. Oops! I clipped them to my belt loop but a few minutes after I got off the ride, I saw that I only had one! I did the same thing as with the shoe - I opened a ticket with Lost and Found when I left at the end of the day. The super diligent Cast Member went looking through all of their stuff in the back to see if maybe it had come in already. She came out with an ear in her hand. Woohoo! Amazing! But wait, it didn't match! Someone else lost the same kind of Minnie ear clip, but it was definitely a newer model (mine was a few years old, remember). The bow was bigger and had a pointier shape. Mine was rounded. I was so disappointed! I left the next day to go home and while I was on I5 in the complete middle of nowhere, I got a call from Lost and Found. They found my ear. They were sure of it this time. Some of my family was still at Disneyland so they went to pick it up for me. They brought it to my house when they got back. I took one look at the ear and laughed. It was the exact same pointy-bow ear they had tried to give me that very first day! Oh well, it's the thought that counts right? What Lost and Found stories do you have? Let us know! I lost my celery phone while watching Fantasmic. The next morning it was waiting for me at the Lost & Found with a note attached with my name and the hotel at which I was staying. I asked the CM how they knew it was mine and where I was staying.They replied, "Mickey knows everything." When I returned home, I was asked by a friend if I had retrieved my phone. This friend is the first name in my contact list. The CM had called him to find the phone's owner. Typical Disney, going above and beyond expectations.